As a trend forecaster and designer, I see the responsibility we hold in informing our clients. Season after season. Collection after collection. With more and more raw materials, resources extracted from the planet. I have chosen to focus on relationships that breed more awareness around sustainability and push an urgent agenda. But above good will, we must change the system. It is exciting to see the progress being made by many organisations tackling climate change and placing it at the core of their existence, including the most notable trend agencies. Some of the most powerful innovations come from materials designers and agencies enabling both small and large fashion businesses to integrate sustainability. A fast increasing number of resources are now available to embed circular economy and design principles. 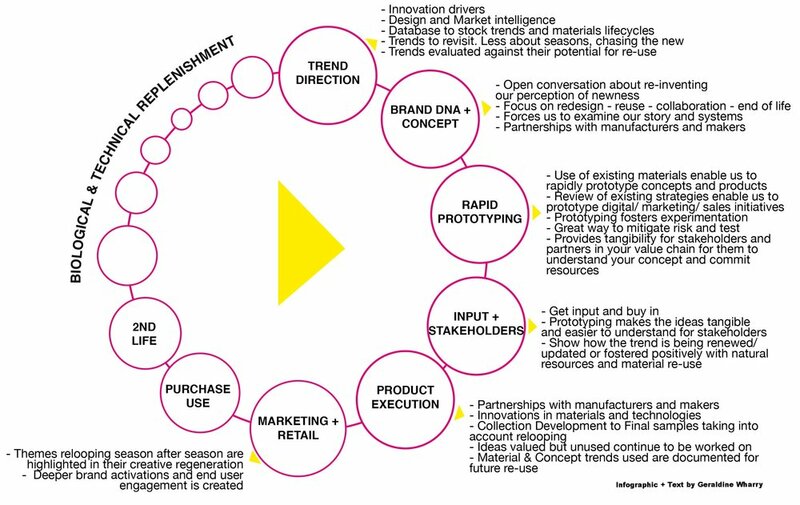 IN FASHION TREND FORECASTING WE MUST examine how to eMBED THE circular DESIGN SYSTEMS. This would require a collaborative effort ACROSS THE INDUSTRY to create intelligent libraries. I see a future of trend insights where we can point out when for example the same colour is being used from a past season, linking it back to a manufacturer who would still have that colour in stock. Intelligent materials and trend libraries connected with live feeds of suppliers stocks. For this AI and software development would come into play. This would avoid unnecessary re-manufacturing and would require buy-in from manufacturers who must also explore new economic models and technologies to eliminate order minimums. The vicious cycle of over-ordering due to high minimums, and at the far end of that, unsold stocks ending up in landfills or fire-pits must be a thing of the past. And for this we must think creatively and engineer new economic models. Currently our system is linear and revolves around Take Make Waste. Although this is gradually changing to a sustainable model but unfortunately not fast enough. Because the style industries depend on trend forecasting, there is a massive opportunity to connect resources and assess the repetitive cycle of trends, taking note of the global agenda and influence of organisations such as the Ellen MacArthur Foundation. the way we select and harness collection concepts examining which themes we have previously used so that we can build upon existing ideas and stocks. how we source at trade shows by making in-stock materials and recurring trends a highlight for re-use. We are already seeing key tradeshows such as Magic and Premiere Vision focusing on sustainability. how we retail and market brand activations to celebrate a continuous form of story telling and brand engagement beyond seasons. We need designers, creative thinkers. But what we URGENTLY need are system changers. System creators. “Fashion engineers” who will re-think the way resources are connected and re-used to achieve zero impact on the planet. These new roles will sit at the convergence of technology, science, design, marketing and PLM. And trend agencies, forecasters should act as a key resource. One that has been analysing trends, tradeshow reports, street style, consumer insights and can point to when re-use is needed due to repetition of concepts and materials. A trend would be, as always, valued on its creativity. But it should also be evaluated on how it enables recycling, which would offer a completely new way of harnessing fashion trends. They are not just ideas that live in thin air. They lead to global shifts in manufacturing and raw materials extractions. This is why they are key within our sustainability goals. We must have an honest conversation. Fashion trends are moving slower than before and as such we see the same themes re-hashed season after season. Shouldn’t this be a powerful fast track to re-using fabrics, trims, colours? If brocades and pink are on trend for several seasons, why do we keep manufacturing new versions? Can we afford this luxury at this stage? I think not. Of course there is a need to create, explore what is next. Curiosity is a fundamental part of being human. However we have some radical choices to make to tackle the climate change we are responsible for as the 2nd biggest industry polluter in the world. WE NEED TO DRASTICALLY RETHINK HOW WE UTILISE TRENDS. IT’S AN ETHICAL RESPONSIBILITY WHICH IF SUCCESSFULLY ACHIEVED COULD MAKE TREND RESOURCES ONE OF THE PILLARS OF A CIRCULAR FASHION SYSTEM. Why? Trends are Naturally Collaborative and Cyclical. From Macro to Seasonal, trends are an eco system formed of molecules. These molecules reflect key topics shaping how we engage in the power of dressing. The circular economy is restorative and regenerative by design. 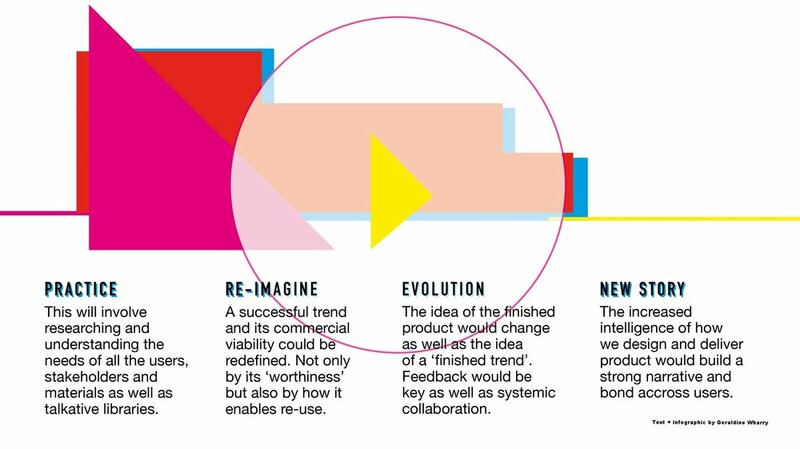 If we can have a proactive and embedded design approach, where materials are designed with end-of-life recovery, we would essentially be mimicking the natural circularity of trends. In the circular world design is never done. Products and services are redefined to push waste out and minimise negative impacts. The circular mindset looks to everyone who extracts, builds, uses, and disposes of things. The role of the designer and the future fashion engineer can come at any point in the cycle. And this is the beauty of circular design. It requires opposing ends of the fashion spectrum to collaborate and examine the full life cycle of a product and come up with solutions to the specific material and design challenges they face at each stage. The circular model builds creative and social capital. It is highly collaborative and innovative. How can we can bend the arc of our traditional linear model to create our preferable future? Trend Forecasting has been utilised to follow trends and commercial reality is important. However, in its core and ultimate ideal, Trend Forecasting is about creating the future. Echoing this week’s Nobel prize in economics William Nordhaus and his optimism, we must be proactive. We must see this urgency as an amazing opportunity for innovation. BUILD New perspectives on the ‘New’ in a future that is circular. Let us not be discouraged by the behemoth task at hand. Let us not continue in the kind complacency of “trying”. Or thinking about it, talking about it, but then everyday using the wrong recycling bin. If change happens, first it has to start with the simplest habits now. We must walk the walk to stop further temperature elevations before it’s too late. And that too late date is within a few years as the UN explains in its explosive report last week, the full length of it available here. uproot our destructive current ways. This will require determination to take risks and uproot financial and political interests. However these risks are far lesser than the cost of millions of humans falling victim to hunger, environmental catastrophe, poverty and war. protect what we already have against catastrophe by building contingency plans, whilst creating a new permanent system structure. Many years ago I dreamt of a skyscraper city (probably NY as this is where I was living at the time) which functioned fully even though it was submerged. In this surrealist landscape you could work in underwater offices of buildings erected long before global warming. The foundations and first 20 floors or so had been reinforced so it was business as usual. We must be realistic and pragmatic. If we cannot change the system fast enough, what is our survival plan?